The Master Gardener Program in Grant County started in 2002. Over 115 people have been trained since that time, and there are currently 24 certified Master Gardener Volunteers (MGVs) for 2017. The UW-Extension Educator facilitating the MG Program is Crops/Farm Management Agent Ted Bay. MGVs participated in a Mother’s Day Celebration, which included breakfast, animal peƫng and creating a flowerpot for mom. MGVs assisted children in the poƫng stations to decorate a container and learn how to plant pansies, marigolds, and petunias in it, and how to care for it at home. 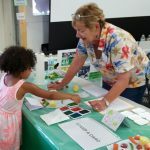 At the first Platteville Area Farm Days in July, attended by over 500 people, MGVs oﬀered UW-Extension materials on alternative gardening styles and answered gardening questions. Demonstrations were oﬀered for the public on composting and straw bale gardening. MGVs participated in Lancaster Community Hospital Week by oﬀering a session on how to start a garden and small space gardening as healthy options for stress reduction, healthy eating and well-being. About 30 people attended two sessions on planting salad bowls, with participants planting a container with plugs of leafy greens, and leaving with instructions on how to maintain and harvest their projects. 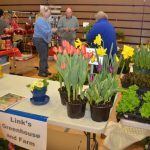 On Saturday, April 2, over 70 people gathered for the first garden conference in this area organized by MGVs and the Horticulture Club of UW-Platteville. The event included educational table displays by MGVs, workshops and talks by MGVs and other experts, and a keynote presentation by Lee Somerville, author of the book Vintage Wisconsin Gardens: A History of Home Gardens. The students introduced speakers, helped with registrations, acted as greeters and gave guided tours of the UW-Platteville greenhouses. The Master Gardener Program in Waukesha County started in 1998. Over 1,084 people have been trained since that time, and there are currently 246 certified Master Gardener Volunteers (MGVs) for 2017. 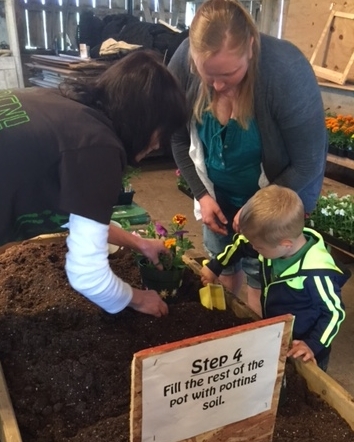 The UW-Extension Educator facilitating the MG Program is Consumer Horticulture Educator Ann Wied. The Master Gardener Program in Columbia County started in 1999. Over 220 people have been trained since that time, and there are currently 32 certified Master Gardener Volunteers (MGVs) for 2017. The UW-Extension Educator facilitating the MG Program is Agriculture Agent George Koepp.